All good blankets deserve a name so I have named this Autumn Falls. All I can say is phew! I am glad I have finished this. The colours are so not the colours I would normally choose. But I learned a great deal about colour and tone, and am glad I came out of my comfort zone for this. 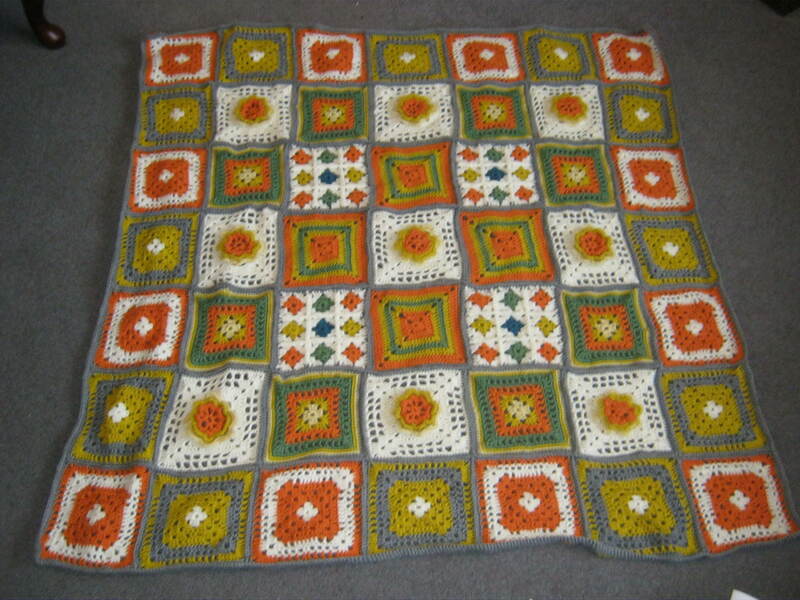 The blanket will go to a care home for the keeping warm of the old knees. In the meantime I shall just sit and look at it. Once again bloggers thank you. This was a communal effort. You are lovely. Consider it a huge success, both in terms of the finished item and lessons learned. It will be a much appreciated blanket by the recipient, I’m sure. Thanks Sheila, a very kind comment. Wow! Not my color scheme either! But it is stunning! Beautiful job as all your makes are extraordinary and so fun to see! What a learning for me thru you! Amazing considering I have American roots starting in the 1700s. How did those Brits find each other?? Just had to share since you mentioned you have quite a mix in yours. I was shocked to say the least. The rest is 13% Finnish (great Grandpa lied here, he wasn’t Norwegian!) and 7% Western European?? ?- we have no idea who they could be! LOL! No one fessed up! Isn’t the DNA bit exciting. I was so British it was almost disappointing, nothing unexpected anywhere! Yes it was great fun! At least you have an excuse for all that Brit blood! You are there!LOL! I thought I’d be more Heinz 57 (mix) after us all being in America so long! ;o) oh well! Maybe my Grands! It turned out wonderful and it has a history behind it now. The Contented Crafter has an artists eye. Anyone would be happy to have that lap blanket. That sense of accomplishment is so sweet and worth savoring. Have a wonderfilled week. I love it! I’d have a hard time letting it go–you’ve been together so long. But imagine the pleasure it will provide someone who needs a lift to their day! Good job, pushing yourself to learn and open yourself to input from others. That Contented Crafter is a smart gal! Isn’t she just, and I love the idea of providng warmth and colour to an older person, they deserve nice things. It was a lot of work but it is ao pretty, it was worth it! Thank you. I am glad I put so much work into getting the blocks right. They certainly look perfectly made and matched, and all go together so well! It is absolutely beautiful. I think the colours are perfect and goes together so well. They really are eyecatching. 🙂 Well done. Well done! Are you inspired to crochet more blankets now or will you be taking a break? Attic 24 bag next, and certainly more blankets to come. Thank you, I really hope so. Oh well done Cathy! These aren’t my colors either, so I am extra impressed not only wi the final result, but that you kept at it! Persistence pays, and now someone will be warmed inside an out by this bit os bright cheer. It’s a lovely, warm, cheerful looking blankie, and old knees will be warmed and old faces lit up by the happiness of the colours. Nice work, and fun that it was a learning experience as well as a labour of love. Thanks Kate, if it cheers one person at the care home that makes it all so worth while. Lovely! It will be cherished. Fantastic! Great job and a very fitting name. Well done for getting out of your comfort zone. I’m sure the recipient will love it. Thank you, the name just came to me and I am glad I decided it deserved a name. Thank you, yes I am pleased it was worth the effort. Lovely job! As an autumn person, most of your colours are favourites! Beautiful blanket and I love the name. It is sure to make a special someone feel warm and snug and bring a smile to their face. Congrats on the finish! I don’t normally give my projects names but this one deserved one. Thank you, I learned a lot about tone, which was not something I had thought about before. That blanket turned out SO well Cathy. It is sure to brighten up the room and give the lucky recipient cheery comfort. How wonderful to have completed it. First finish of the year! Glad to have this one under my belt, it was a bit of a challenge. It’s gorgeous – and will delight the recipient!